I blame Sally Bowles. Back before Christmas I re-watched Cabaret, agog at its brilliant, highly disquieting skewering of the 1930s Weimar Republic. Alongside the increasingly disturbing contrasts - and parallels drawn - between the glitz of the cabaret and the horrifying, unstoppable surge of nationalism sweeping the country, I ended up caught on a rather more superficial detail: Liza Minelli’s glittery green nails. With each new flourish of her hands, I was mesmerized. For days after I couldn’t stop thinking about them. I wrote about them for AnOther (alongside some other delectable details, including Carol’s fur coats and Elio’s sublime Matisse-shirt-over-polo-neck combination in Call Me By Your Name). Then I went in search – a woman possessed as I dropped in and out of branches of Boots and Superdrug in pursuit of all things fern, emerald and bottle green. Turns out green nail varnish is quite hard to find. But I succeeded: finally painting my nails in a particularly lurid, slightly chalky Rimmel shade well-suited to sixties crockery. Something dark and sparkly followed. Then a lighter-toned green, the exact colour of the foil wrapper of a mini easter-egg. Now I’ve got a small flock of greens, all lined up on my dresser. There’s something incredibly pleasing in the sight. Although I umm and aah over this regularly, I think I’ve accepted that green probably qualifies as my best-loved colour. That much would seem apparent if you opened my wardrobe and took stock of the green skirts in suede (short) and satin (long), the green silk shirts, the various shades of green blazers and coats, the green costume jewellery earrings and necklaces, green high-waisted trousers, green striped polo-neck, green leaf-print dress, and four – four! – varieties of seventies green synthetic gown. The latter is another point of mild obsession. Point me in the direction of a verdant-looking, highly flammable fabric with a sweeping skirt and some kind of interesting sleeve detail, and I’m hooked. In Derek Jarman’s Chroma, he writes of how “we feel green has more shades than any other colour, as the buds break the winter dun in the hedges. Hallucinatory summer days.” It seems an especially apposite observation today, when the sun outside feels like the first sweeping in of Spring – and I’m sitting here, in my living room, in a green kimono flecked with pink flowers, dreaming of the summer yet to come. Yesterday, with an hour to kill in Oxford, I went to the Botanic Gardens. When I was studying there and the bitter grey winter air threatened to overwhelm, I’d often head to the Gardens – slipping into one of the greenhouses to breath in the tangy, damp warmth of ferns, and dry comfort of the cactus room. There, enclosed in glass, winter didn’t feel quite so endless. It had the exact same effect yesterday, with the added bonus of clumps of white snow-drops and lilac crocuses nosing up through the soil outside. Of course, every colour has this complex web. Maggie Nelson writes in bright, brilliant fragments about the resonance of blue in Bluets. Sinead Gleeson tackles pain, fairytales and Frida Kahlo in Your Chroma: a searing examination of red. Derek Jarman’s Chroma, referenced above, rattles through the whole scope of the rainbow – violets, yellows, greys, greens and more scrutinized, cracked open, held up to the light. 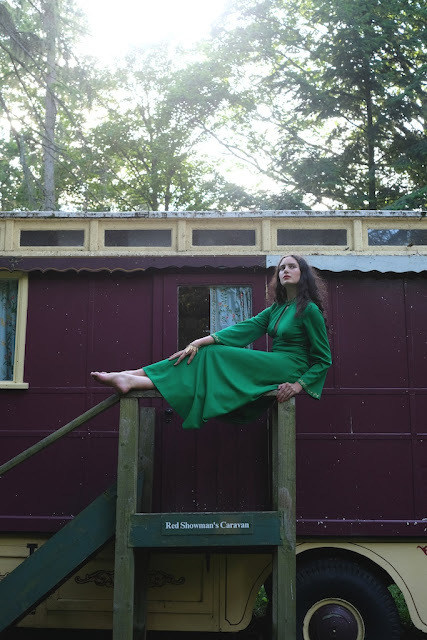 These photos were taken over the summer by my top pal Holly when we spent a week over the summer staying in a caravan and running around the woods in all manner of ridiculous garments: quite a few of them, unsurprisingly, green.